Clinically proven corn removal. Active medicated centre. Self-adhesive plaster. Felt pad relieves pressure.Salicylic Acid 40% w/w Multi-Treatment Pack For the treatment of up to three corns. 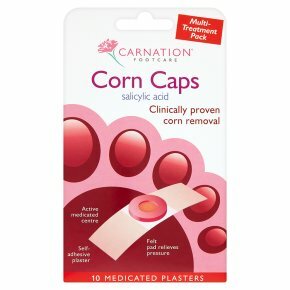 Unique paste penetrates and helps remove hard corns while the felt ring relieves pressure. Recommended for the removal of hard corns. Directions for Use 1. For better adhesion clean and dry the feet. 2. Remove a corn cap from the backing paper and position the felt ring over the corn. 3. Firmly apply in position with adhesive straps. When properly applied it should not slip or move. 4. Change the corn cap every two days until the corn is easily removed. A maximum of five corn caps should be used per corn. Caution<br>For external use only.<br>Contains peanut oil. Do not use if you are allergic to peanut or soya.<br><br>Do not use:-<br>If you are diabetic<br>If skin close to the corn is inflamed or broken<br>If you are using any other medicated product to treat your corn<br>To treat more than 3 corns at a time<br>For any other purpose than the removal of hard corns<br>If you are allergic to any of the ingredients<br>After the expiry date<br>Seek medical advice before use:-<br>If you have a circulatory disorder<br>If using on children under 15<br>If you are pregnant<br>If symptoms persist consult your doctor<br><br>Possible Side Effects<br>While using this product a mild degree of soreness may be experienced.<br>Occasionally local irritation or dermatitis (skin rash) may occur. If this happens remove the plaster and clean and dry the area. Do not repeat treatment.<br>If you get any side effects, talk to your doctor, pharmacist or nurse. This includes any possible side effects not listed on this pack. You can also report side effects directly via the Yellow Card Scheme at: www. mhra.go.uk/yellowcard<br><br>Keep out of the reach and sight of children.